· Applied to the burst/proof pressure test of automobile air-conditioner condenser, heater abd evaporator, etc. Extensively used in production plant, R&D institutions and other units for the purpose of product quality testing/inspection. · Fully automated test stand with high speed data acquisition system. 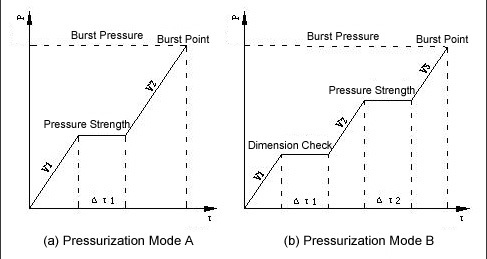 Condenser：Mode A，Pressure strength：50.0bar×3min，Burst pressure ≥110bar. Evaporator：Mode A，Pressure strength：16.0bar×3min，Burst pressure ≥30bar. Heater：Mode B，Dimension inspection：4.0bar×5min，Pressure strength：8.0bar×3min，Burst pressure ≥12bar.